- I used Juliet's small butterfly pattern and reduced it to 80% - in order for the flower not to be humongous once all the small butterflies were combined. 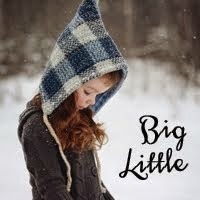 The total size as pictured is 18"x18". - I quilted the middle with pebbles - a first! My eyes actually started tearing up from not daring to blink while at it - didn't want to break the momentum! - The wings have wee twirly-whirly bits quilted in them too - spurred on by not totally screwing up the pebbling, I thought I'd give it a go. At one point I also envisioned there being extra petals between the butterfly ones. So I set about drawing a paper-pieced pattern to make it so! Was a bit happy with the result, though I decided against adding them in the end, and have the quilting make the picture. 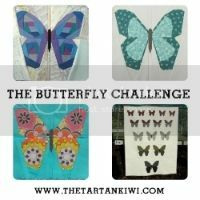 Did you get into the challenge and do something a bit different with Juliet's butterflies? There's still time if you're keen! And did I mention the awesome prizes?? Looking forward to seeing what you've been making this week! Amazing - both yours and Juliets talent - time hmmmmm def lacking in this house ! Its beautiful Leonie. Go you with your fancy quilting! I tried pebbling once an swore never again! Its one of those things that I love when other people do hee hee. Beautiful work - I love the colours you've chosen together too. If you end up making a quilt you could scatter some of your petals around the design. Woohoo! Fabulous, cool fabric choices.........I hope you are back to blinking after all those pebbles! Looks great. super clever drawing up your own paper piecing pattern :-) And this is such a fun design - the pebbles are so tiny, no wonder you didn't want to blink!! Amazing...it took me ages to just make one! Fabulous idea Leonie - I love what you did with this pattern! Beautiful!! It's begging to be completed now - looking forward to seeing what you do next! You girls are all so CLEVER!!! A four leaf clover it was, lucky you and so cute that Rascal painted a picture of it :) P.S. your paper pieced leaf is amazing!